Picture a rice farmer taking soil samples with a handheld meter to gauge nutrient and moisture needs, calibrating planting along plot contours with GPS-guided tools, placing rice in precise rows using a mechanical transplanter, and doing this with the backing of reliable, customized financing. Although it seems far-fetched, this future could be nearer than we imagine and it was the focus at a roundtable on “Sustainable Intensification in South Asia’s Cereal Systems: Investment Strategies for Productivity Growth, Resource Conservation, and Climate Risk Management” held on May 19 in New Delhi. The roundtable brought together 20 of India’s leading firms and entrepreneurs in the agriculture sector: ITC, John Deere, Mahyco, and Claro Energy Systems, to name but a few. Their objective was to explore solutions—innovative products, services, and business models—for India’s risk-prone ecologies. These are the ecologies concentrated in India’s underserved but emerging agricultural markets in Bihar, eastern Uttar Pradesh, and Odisha. 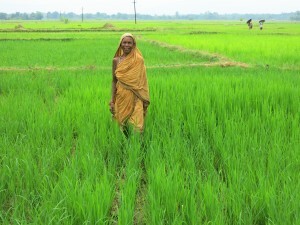 In these places, farmers were passed over by the Green Revolution and still struggle with acute weather and price risk.